Former Conservative Chancellor Ken Clarke has said David Cameron's plans for a British Bill of Rights are "xenophobic and legal nonsense". Mr Clarke said the Tory leader would find it difficult to find lawyers who would agree with his plan to replace the Human Rights Act with the new Bill. Despite heading a Tory task force on constitutional issues, Mr Clarke said he was not forewarned about the plans. Mr Cameron says he wants new rights laws which fit Britain's needs. He says the Human Rights Act, which came into force in 2000, is hampering the fight against crime and terrorism and not protecting key rights. Mr Cameron wants to replace the act, which incorporates the European Convention of Human Rights into British law. A future Tory government would not withdraw from the European convention so people could still take their claims to the Strasbourg courts if they do not feel they have won justice in Britain, he says. 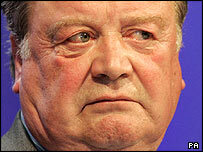 Mr Clarke, a former home secretary and failed Tory leadership contender, has become the latest critic of the proposal. He said he was not saying Mr Cameron hated foreigners. But he argued: "His remarks were anti-foreigner." Mr Clarke told BBC 2's Daily Politics programme the European convention had itself been drawn up by a British lawyer. The Tory leader is appointing a group of lawyers and experts to work out what should be in the new British Bill of Rights. But Mr Clarke said: "He's gone out there to try and find some lawyers who agree with him, which I think will be a struggle myself." The Human Rights Act has come under fire in some newspapers, who believe it has put the rights of criminals above those of victims of crime. But Mr Clarke said: "In these home affairs things I think occasionally it's the duty of politicians on both sides to turn round to the tabloids and right-wing newspapers and say 'you have your facts wrong and you're whipping up facts which are inaccurate'." Despite his criticisms, he said he would not resign as head of the constitutional task force, especially as the new group of experts was looking at the Bill of Rights issue. Ministers have also attacked Mr Cameron's plan as "ill thought out" and "muddled". But it has won support from Labour peer and QC Baroness Kennedy. In a speech to the Centre for Policy Studies in London on Monday, Mr Cameron argued that the Human Rights Act had prevented Britain deporting suspected terrorists whatever the circumstances. It was "practically an invitation for terrorists and would-be terrorists to come to Britain" he said. "I believe it is wrong to undermine public safety, and indeed public confidence in the concept of human rights, by allowing highly dangerous criminals and terrorists to trump the rights of the people of Britain to live in security and peace," he said.